Imagine a team who play attractive football, stick by their manager, offer family value and are tied to their local community. Imagine that, somehow, they are one of the most disliked clubs in the country. Welcome to the dichotomy that is MK Dons. Ten years ago this weekend, the town of Milton Keynes hosted its first ever Football League match. The game? A 2-2 draw between Wimbledon and Burnley. In the summer of 2003, south London second-tier side Wimbledon were wrapped in uncertainty, brought about by a lack of a permanent home and unsustainable financial losses. Cheap for kids: An under-18 season ticket in the family area is £28. It costs an under-seven £6 for the season, if attending with an adult. 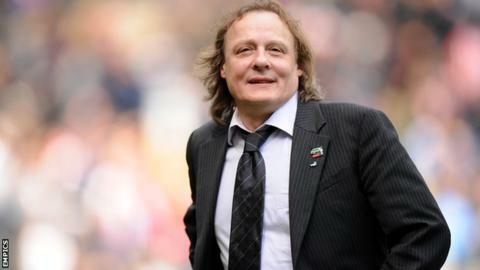 For better or worse, Pete Winkelman's consortium moved the Dons to Milton Keynes, the Buckinghamshire new town. Uproar barely does justice to the reaction from, not just Wimbledon fans, many of whom realigned their allegiance to the phoenix club AFC Wimbledon, who are now a division below MK, but football as a whole. The hows and whys are well documented, regardless of whether both sides of the fence can agree on a factual narrative for how it came about. But, a decade on, with history put aside oh so briefly, is it safe to give a respectful nod towards Stadium MK and the culture Winkelman has created around his club? "I can't replay what happened in the past," Winkelman, the music executive synonymous with MK Dons and its path to existence, told BBC Sport. "What we are going to do is make a difference in our local environment. "Maybe it will never be right until I've gone. But what I have to do as the first chairman is make sure all of the infrastructure is in place for the future." That infrastructure includes an enviable youth setup - with 12 academy products going on to make their first-team debuts, 10 of whom were born within 30 miles of MK1. In the past 12 months, 11 young MK Dons players have been called into age group national teams. The club has 16 disability teams, while the MK Dons Sport and Education Trust interacts with 60,000 people every year. The sense of sanctimony throughout England's football community could perhaps waver when faced with those accomplishments. Or maybe not. "I think the perception is still broadly negative," said Dr John Beech, an honorary researcher in football finances at Coventry University. "It's not just AFC Wimbledon fans who refer to them as the franchise. There is a fairly widespread dislike of them." "In their particular situation, where a new club started 10 years ago and where football didn't really have a foothold in that part of the world, they've had to develop a different strategy, experiment with some new approaches and promote the sport as well as the club. "The evidence I've seen in recent years is that they've not only risen to the task, but in doing so, created some benchmark best practices that other clubs are following." Not that MK Dons fans are pining for approval. "It sounds like the desperate kid at school. 'Please like me, please like me'. People either like you for who you are or dislike you," said John Brockwell, chair of the Milton Keynes Dons Supporters Association. "Everyone concentrates on where we came from 10 years ago. Not where we are." There have, of course, been other British clubs that have moved location and made a success of it. Arsenal's upheaval from Woolwich to north London is now a century old and, more recently in 1995, Meadowbank Thistle left their Edinburgh home to become Livingston FC. Could the passing of time enable a shift in perception of MK Dons? "I certainly hope so," said Winkelman. "People don't remember the Arsenal move now, but maybe it takes 100 years for people to forget - I don't know. "Am I learning about the culture of English football? I hope you can tell I am. Are there lessons to learn from the journey? Absolutely. "But what I need to do is put MK Dons and the people of Milton Keynes first and let history be the judge." Time may also swell MK's fan-base. A town built in the 1960s, that did not have a professional football team until 2003, is inhabited by a generation already attached to another team, the one they grew up supporting and watching. But a League Two title and a Johnstone's Paint Trophy double in 2008 have offered chapters of early history for MK Dons. And Stadium MK is regularly one of League One's more attended stadiums - even if many there are paying to watch their 'second team' - with last season's average of 8,611 beaten by just Sheffield United, Portsmouth, Coventry and Preston. "In the short-term we are a lot of people's second team," said Winkelman. "I'll only grow the audience by having success. "Our goal is to give our fans that sense of history that so many fans taunt us that we don't have yet. And slowly we are." Events of 10 years ago boiled furiously to the surface again last season, when - estranged cousins re-acquainted. Wimbledon and their supporters are unlikely to be persuaded of anything virtuous within Winkelman and, in 2006, the passing of all the former club's trophies and honours to the London Borough of Merton, Wimbledon's spiritual home, did little to ease the tensions. But MK are now a fixture of English football - financially stable, with a stadium set to become a 30,000-capacity in a few weeks' time and preparing to host 2015 Rugby World Cup games. "In reality MK Dons are here to stay. And I would prefer to see some reconciliation," said Dr Beech. "Will it happen? I hope it will over time. "And while MK Dons gave back the heritage, they kept the name 'Dons'. To me there is still this major impediment that they stole the name and haven't given it back." Winkelman has previously said the decision of whether to drop 'Dons' from their name lies firmly with his club's supporters, who have expressed little to no interest in the idea. But what about the one thing - or man -that intrinsically links MK to the stigma of that move a decade ago? "Pete and MK Dons come together. It's very much bound up in Pete's vision," said Brockwell, who has lived in Milton Keynes since the late 1970s. "He's definitely had to put his money where his mouth is. But for all of that he is inevitably bound up in the club." Winkelman, who has outlined a new training facility as the next step in the MK journey, does not dismiss outright the concept that MK Dons might be better received when he is gone. "I understand that argument. It's been put to me a number of times," he said. "But I cannot be confident of somebody else coming in and not looking at the big picture of what MK Dons needs to be about. "I trust myself to do the right thing. I can't think of a time past me until everything is in place." The MK Dons approach could well convert some doubters - but others believe wounds last longer than a decade.